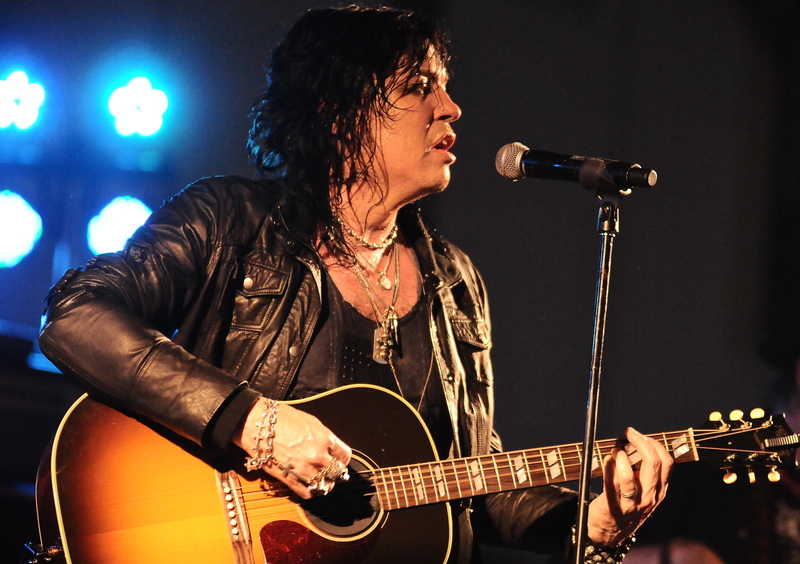 Braun’s Concert Cove was the place to be on Sunday as Cinderella’s Tom Keifer joined up with Faster Pussycat, The BulletBoys and Gilby Clarke to put on a glorious show that brought back memories of yesteryear. Keifer is still touring in support of first solo record last year’s The Way Life Goes. Taking to the stage with Cinderella’s main opening song “Night Songs”, Keifer kickstarted the spirited affair and sounded the best he has yet since his vocal chord problems of a few years ago. The seventy-five minute set was a good mix of solo songs and Cinderella classics exactly as advertised. A pair of solo songs “It’s Not Enough” and “A Different Light” promptly followed. Keifer’s wife Savannah came out to help sing as they sat on stools for “Ask Me Yesterday” and “Don’t Know What You Got (Till It’s Gone)”. The solo songs drew a pretty good response from the crowd which shows how strong the material is. It seemed Keifer’s vocals were getting a tad weaker during “Coming Home” as they did not seem as crisp but by the time they delved into the bluesy “Shelter Me” those thoughts were a distant memory as Keifer and his band knocked it out of the park. I actually felt goosebumps as Keifer delivered by far his best vocal performance of the night. It’s been two years since Keifer’s main band Cinderella has toured (with the exception of their 2013 Monsters Of Rock Cruise shows). Incidentally the last Cinderella show (on land at least) took place here at Braun’s in 2012. Keifer has assembled quite a band which includes guitarist Tony Higbee, drummer Paul Simmons, Billy Mercer on bass and keyboardist Paul Taylor. Yes it’s the same Paul Taylor who once played with Alice Cooper, Winger and Cinderella. With the band being so solid Keifer may choose to make another solo album and keep touring. Stay tuned. The glam metal band from the streets of Los Angeles, Faster Pussycat landed the coveted spot before Keifer and delivered a sound set. Lone original member singer Taime Downe is still at the helm as he led guitarists Xristian Simon and Ace Von Johnson, drummer Chad Stewart and bassist Danny Nordahl through a rapid forty minute set that featured usual FP standards like “House Of Pain”, “Slip Of The Tongue” and “Bathroom Wall”. Marq Torien and his latest version of The BulletBoys played a brief six song, twenty-five minute set which was capped off with the bands big song “Smooth Up In Ya”. Torien also took the time to mention how appreciative he was that The BulletBoys were able to tour with Cinderella and Winger on the Long Cold Winter tour so many years ago. That show hit the defunct Niagara Falls Convention Center in 1989 for those history buffs. Getting things on main stage started was Gilby Clarke. Clarke who of course is known for playing with Guns N’ Roses and Slash’s Snakepit played as a three piece during his fifty minute set. His band consisted of Faster Pussycat drummer Stewart and bassist Nordahl. The set featured a few solo songs and a few covers notably the Stones “It’s Only Rock ‘n’ Roll”. Following Monday’s news about a new sound ordinance in Newstead, the days for Braun’s may be numbered. All the hard work and dedication by owner Ray Braun and others may go down the drain if this venue is unable to host live music events. Hopefully justice will prevail in the end and the shows will continue (all currently booked gigs are still on), if not this may go down as the best show in Braun’s all too short three year history.